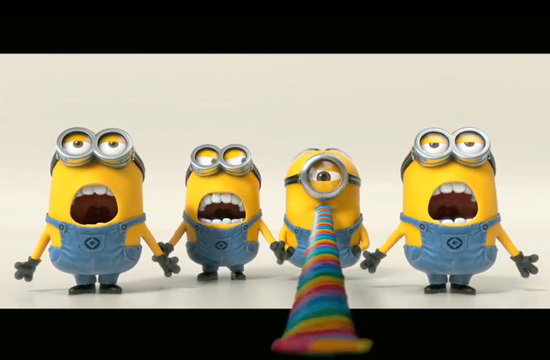 Cultural Compulsive Disorder: The 'Despicable Me 2' Teaser Trailer Has Me Fiending For Banana's & Minions!!!! The 'Despicable Me 2' Teaser Trailer Has Me Fiending For Banana's & Minions!!!! Despicable Me was one of the most surprising animated movies I had ever seen. I thought it would be cool, but the film ended up being quite awesome on many different levels. Besides the awesome soundtrack courtesy of Pharrell & the killer performance by Steve Carrell, my favorite part of the movies would have to be The Minions. These little yellow baddies make the film. So it is no surprise that they have been rolled out to compile a teaser trailer. If you haven't seen this yet, you are sure to love this musical number. But if you are like me and have seen it, you will want to watch it again and again!!! Despicable Me 2 is out in 2013.Enjoy it after the break.... and put that party noisemaker down asap!!!! !